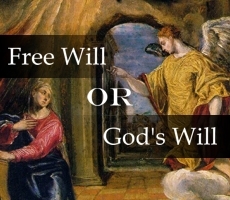 Free Will or God’s Will? It is an act of the will to deny free will, and those who insist upon doing so deserve to be put in the same category as those who refuse to accept the fact that the earth is a sphere. As Catholics, we of course take free will for granted, as well we should, for it was granted to us as a free gift. Besides, it would not contribute much to good mental or spiritual health to deny the obvious. There is no questioning the sheer factualness of free will, but that does not mean that serious questions concerning the nature of free will cannot be raised, as well as questions about how free will is to be properly understood with respect to our relation with the omniscient and all-powerful God. One question which is often raised regarding the matter of free will is this: How is it related to God’s foreknowledge? Put more pointedly, how is our free will to be reconciled with God’s foreknowledge? Let us begin by stating the problem clearly. God, both faith and reason tells us, is omniscient. He knows every aspect of our lives, down to the tiniest detail. Furthermore, He knows what St. Thomas calls future contingencies. What this means, in plain terms, is that God knows exactly what you will freely choose to do tomorrow afternoon, or next Tuesday morning. But does not God’s foreknowledge then determine what you will do tomorrow afternoon or next Tuesday morning, so that you will not be acting freely after all? The basic idea is this: because God knows what you will do in the future, what you will do has already been settled, and though you may think you are acting freely, you really are not. God’s knowledge has programed you, so to speak, to act in a certain way, and you are destined to act in precisely that way no matter what. Is that an accurate account of what actually happens? No, it is not. God’s foreknowledge of our free acts in no way impedes, much less cancels out, the freedom with which we perform those acts. By way of offering an imperfect but nonetheless helpful explanation for this, I invite you to consider how it is the case, even on a purely human level, that foreknowledge does not determine free acts. Is it not true that sometimes we can be pretty sure, perhaps almost positively sure, how certain people, people whom we know very well, are going to act in certain situations? Given the person, given the situation, we can confidently predict what is going to happen. Take the case of my cousin Cassandra. If you bring up subject X with Cassandra, I can guarantee that she is going to respond in Y way. I’m willing to bet on it. Cassandra will be here in five minutes or so. I ask you, when she arrives, to bring up subject X with her. Cassandra arrives. You bring up subject X, and, sure enough, she responds just in the Y way I said she would. Now, here’s the point: Did Cassandra act freely when she responded in the Y way to subject X? Yes, she did. Did the fact that I knew beforehand how she was going to respond make her act a bit less free? No, it did not. That explanation is far from perfect, for there is no comparison between God’s foreknowledge and our own, for His knowledge is infinite and absolutely infallible. I can be wrong about what Cassandra will do in certain circumstances, in fact, in most circumstances; God is never wrong about what we will do in any circumstances. A footnote to the above. We speak of God’s “foreknowledge,” but that is actually a misnomer, a concession to our limited, time-bound intellects. The term suggests that God looks into the future, but there is no future for God, nor any past. He lives in an eternal Now, and by a vision which is forever of the present, He sees what is for us past or future. Another question regarding free will has to do with how it is to be reconciled with the fact that everything, literally everything, we do is ultimately explained by the sustaining and enabling power of God’s will. It is fitting that we recall here Our Lord’s arresting words: “Without me you can do nothing.” We are incapable, without the enabling power of God, of performing any act at all, even a sinful act. (And that, by the way, is what makes sin so supreme an insult to the Divine Majesty.) But does not that then mean that it is God who is doing everything, and that we are not really free agents? Is it not He who acts, not us? But back to our question: If we are incapable of doing anything without God’s enabling power, how can we be said to be truly free agents? As is the case with God’s omniscience, in this case too there is no incompatibility between God’s omnipotence and our free will. Here is the key to the issue. God enables us to act precisely as creatures who are possessed of free will, just as He enables all of the non-free agents in the universe to act according to their proper natures, in strict obedience to the laws He has established for them. God’s power is the explanation for the actions of non-free agents, as non-free agents; and His power is the explanation for the actions of free agents, as free agents. The fact that we can do nothing without God does not cancel out our freedom; it in fact makes it possible, for what He enables us to do is to act as free agents. God wills that we should act just as the creatures He created us to be, that is, as intellectual beings who are themselves the originating sources of the choices they make. It is God’s power that explains the necessity behind the apple falling from the tree to the ground. It is God’s power that explains the freedom of the man beneath the tree who bends down and picks up the apple. “Without me you can do nothing.” Yes, but what we do, as rational creatures, we do freely.